Learn the secret to making delicious 'fast food' at home! RBTH publishes an excerpt from 'Adventures in the Slavic Kitchen: A Book of Essays with Recipes' by Igor Klekh, published by Glagoslav Publications. The cookbook is a remarkable insight into the world of Slavic cuisine, revealing previously unknown details, especially about its origins. This is the story of home-made fast food, simple yet very delicious. Fast food can also be surprisingly tasty when it's truly homemade. In the morning it could be common French toast made of white bread, well moistened in a whipped egg with milk, lightly salted, and browned on melted butter. They will be a splendid complement to a cup of coffee with milk or cocoa! It would be even simpler to stick a little piece of French bread on your fork, and brown it on an open gas flame, or warm it in the toaster or on the wire rack of a toaster oven to a crunchy state. In principle it's a good idea to toast any day-old bread before eating it and freshen dried out bread by tightly wrapping it in aluminum foil and putting it in a toaster oven. Thanks to the remaining moisture in it, it will soften on the tray of the toaster oven in a matter of minutes. What exactly is a Soviet sandwich? An open-faced hot sandwich will require more effort. On the other hand, by itself it can take the place of a substantial breakfast or lunch. Sprinkle an inch-thick piece of French bread with soy sauce, spread butter on it, place a few pieces of canned Pacific saury or skipper fish on it, cover that with several slices of hard-boiled egg and several slices of fresh cucumber or a pickle, sprinkle with chopped scallions or yellow onions and greens, spread a little bit of mayonnaise and sprinkle with grated cheese, after that place it in the toaster oven for 4-5 minutes. A lot simpler and healthier than this multistoried construction is a hot open-faced sandwich with baloney (it is called “Doctor’s Sausage” in Russian), covered just with a wedge of pineapple. It's impossible not to say something about a simple dish of eggs with brisket, bacon, or even salo (pig lard). First, sauté yellow onions in butter on a frying pan on high heat. To it you add finely chopped brisket and squares of white French bread, (preferably dried to a crunchy state in a toaster oven in advance). After several minutes eggs are added, at least 64 one of them should remain sunny-side up. The eggs are salted, sprinkled with chopped green onions and greens, and if you desire – with grated cheese. Do not cover the eggs with a lid, and do not over-dry them, work it a little bit with a spatula. Serve it hot, steaming and with a wafting aroma. When I stay up too late, I sometimes prepare these kinds of eggs even at night, which is awfully unhealthy, but devilishly tasty. My sleepy wife sometimes comes out at the scent and sounds reaching her from the kitchen, and then, of course, I'm obliged to share it with her. 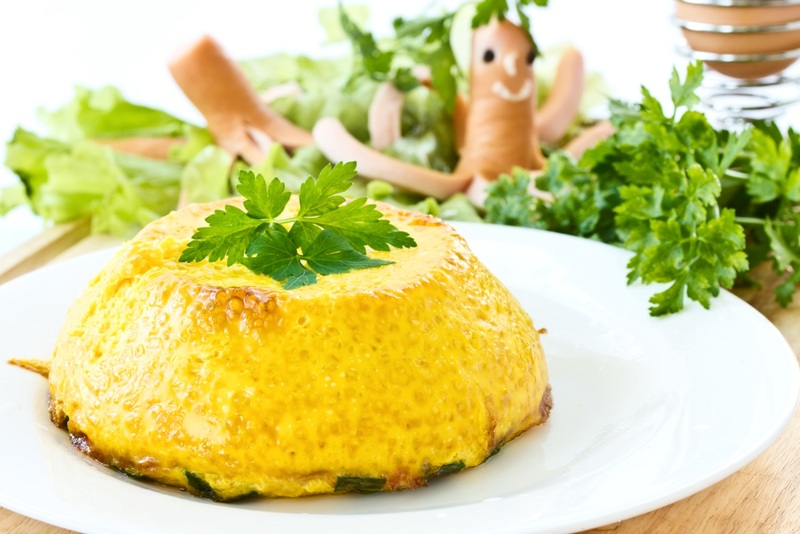 A dietary steamed omelet, which is extremely easy to prepare, will be better for children and the elderly. Pour a glass or two of water into a pot and bring it to a slow boil. In a large tea bowl, well greased with butter, whip an egg until it turns frothy, and salt it. Stirring it, add a little bit of sifted flower, and place the tea bowl into the pot. Cover the tea bowl with a saucer, and the pot – with a cover, and keep it on the burner for ten minutes. You'll end up with the tenderest airy omelet that you need to eat immediately before it sags in (for it not to sag, you can add a pinch of baking soda, though the taste of the omelet will become more coarse). And finally, the Soviet classic – navy-style macaroni. Somehow people are getting too lazy to prepare it, but boiled meat is almost always left in the refrigerator from bouillon. You need to grind it through a meat grinder. In a frying pan sauté onions with vegetable oil, add boiled ground meat, a little bit of chopped greens, and boiled macaroni (the best of them are those requiring the longest cooking time – for cooking time look at the instructions on the package; cook them in a large quantity of salted boiling water with bay leaves), then combine all the ingredients, cover the dish with a pot cover and for a few minutes keep it on a stove with the burner turned off. Pickles go very well with this dish. The dish is an unsophisticated one, but very solid and filling. This is an excerpt from 'Adventures in the Slavic Kitchen: A Book of Essays with Recipes' by Igor Klekh, published by Glagoslav Publications, 30th September 2016.